an international event organised by Sierra Endangered Cat Haven (now known as Cat Haven Wild Animal Park), Dunlap, California. Whilst working on the painting, I went on-line to look up something or other on servals and came across the Cat Haven website. such recognition after just a year or so of painting professionally. 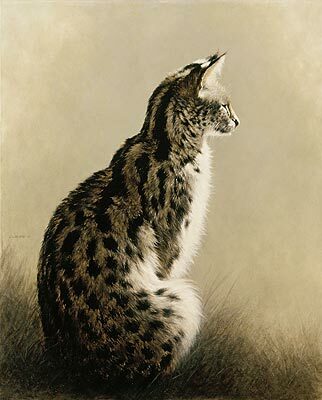 Serval 2001 was purchased for the Worrell Collection of Animal Art, Charlottesville, Virginia, another unexpected and great privilege.